A lot of video games have a tendency of glitching out on us, whether we purposely try to get them to or not. When they do, it either causes them to break down or let us do things we normally wouldn’t be able to. This happen to some more than others, but it’s definitely more common with games from older consoles. This is especially true with those released for the Nintendo 64, and just like Ocarina of Time, Majora’s Mask is no exception. Youtuber ThatOneShowFUN has a video series called Eggbusters where he tackles different video game glitches. 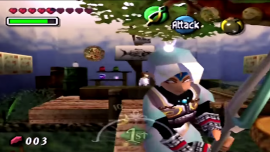 In his latest video, he explores Majora’s Mask for a second time, checking out two more glitches he hadn’t previously touched on. He has to input certain commands in some specific places and, if done correctly and with the right timing, they allow him to do some interesting things. One of them lets him freeze Link in a certain animation while riding Epona, making it so that he can continue to control the horse on its own while leaving Link behind. The other lets him roam the entirety of Termina transformed as Fierce Deity Link, something not normally allowed since the mask can only be used during boss fights. It’s odd how fun these glitches can actually be, so long as they’re not the type that end up messing with your game or save file. I’d love to try these two out whenever I get the chance. What about you? Will you be trying these glitches out or are there any other you’d like to do? Let us know in the comments below!